You may have noticed I’ve got a hankering for bacon & syrup at the moment. It’s the heavenly amalgamation of sweet, salty and smokey that does it for me. It sounds so wrong on paper, but seriously all you sceptics should give it a go. I doubt you’ll be disappointed. 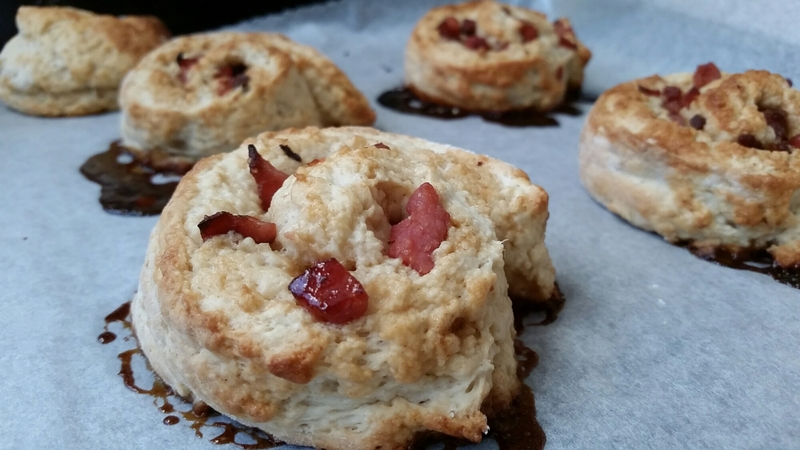 For these swirly scones I simply whipped up a batch of basic scone mixture. I happen to like this one by good old Delia Smith. 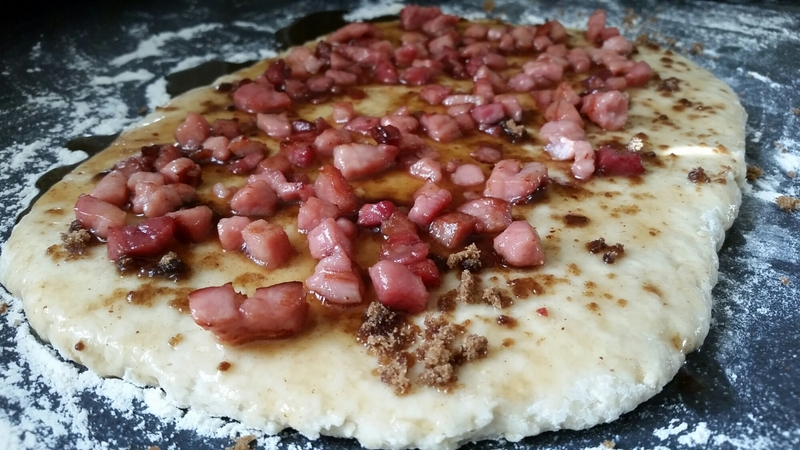 Once the dough is made, set it aside and fry off 150g smoked bacon bits until cooked. I prefer to use a lean cut, but you could use lardons from the belly pork if you like. Once they’re cooked and a little crunchy, turn off the heat and add in 4 tablespoons of maple syrup. 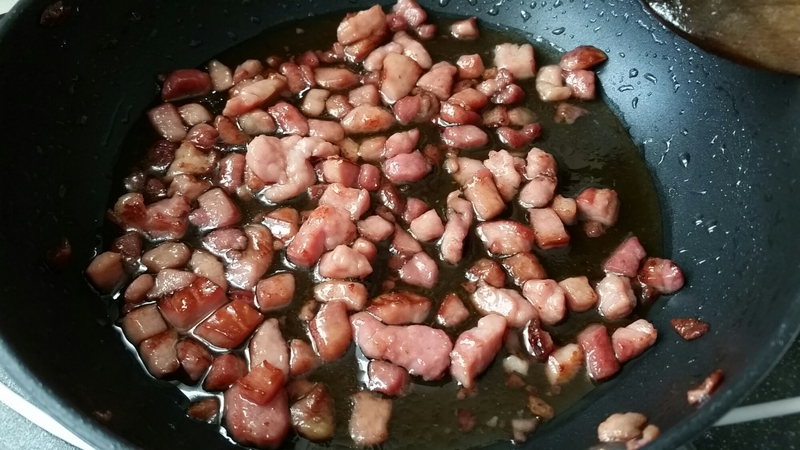 I added in half a teaspoon of sea salt flakes as well as I didn’t think my bacon was salty enough to offset the sweetness of the syrup, but I’ll leave it up to you to decide whether yours needs it. 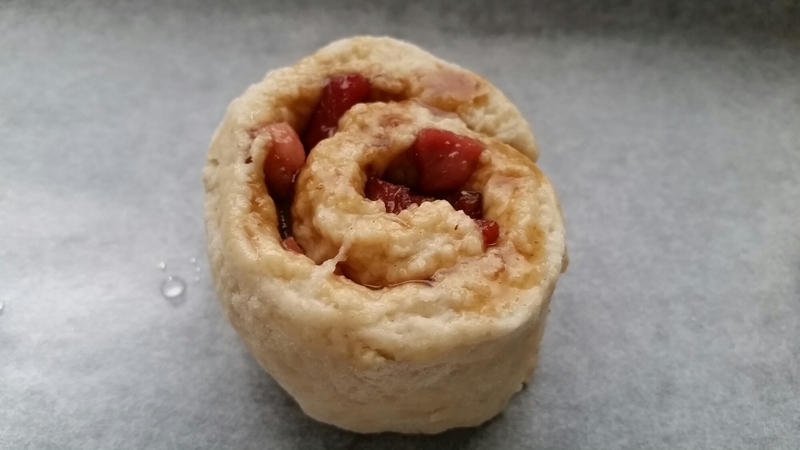 Let the mixture cool as you roll the dough out. 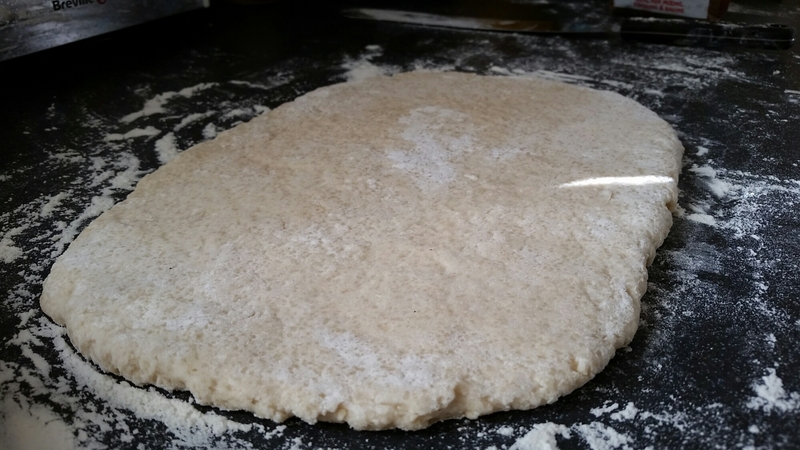 Roll out the dough into a roughly oblong shape. 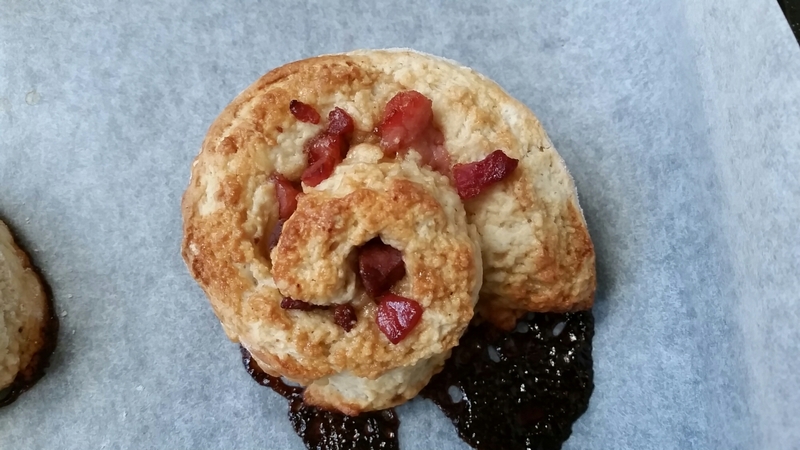 Use a pastry brush to brush the dough with the warm syrup from the bacon bits pan. Sprinkle over a scant amount of dark brown sugar, before scattering over the bacon leaving a gap if about an inch on one of the long sides. Roll it up starting from the opposite side. Slice off the scraggy ends and squish them together. This is important. You’ll see why later. Put it on a lined baking tray. 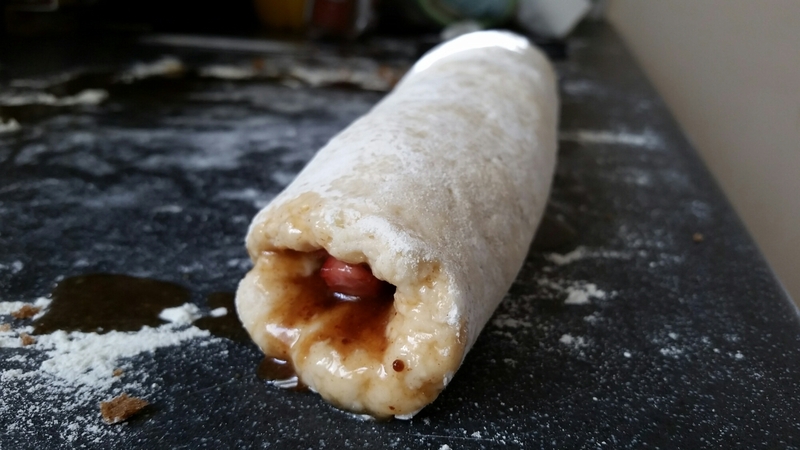 Now slice the roll into 6 equal portions and add to the baking tray. Bake for around 16 minutes in a 200oC oven, or until golden brown. These tasty morsals are a present for a friend who’s celebrating his birthday tomorrow, so I transferred them to a foil container and allowed them to cool whilst I concocted a glaze. I’m afraid I don’t have measurements for this as I made it up as I went along. To icing sugar I added maple syrup, a teaspoon of camp coffee, a glug of double cream and then I loosened it all with a dash of milk. 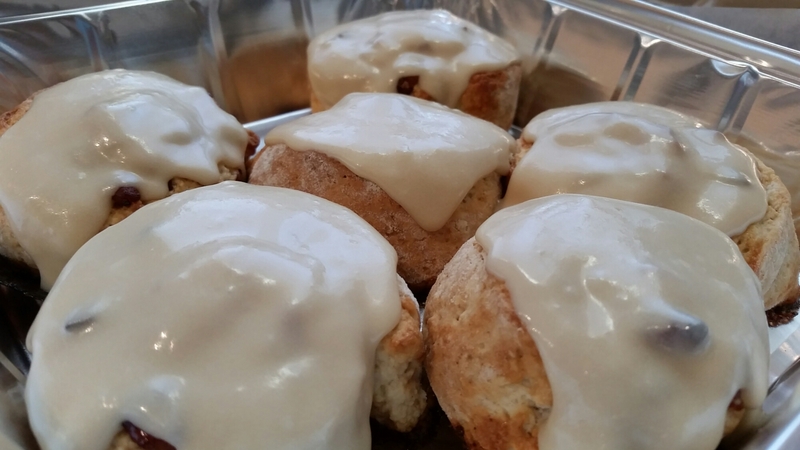 When you’re happy with the taste, spoon it over the scones. These are best enjoyed warm, so if you can resist eating them straight away store them in the fridge until you’re ready to use them, then warm them through in the oven for a few mins. Oftentimes I dream food. I’m sure I can taste in my sleep. Occasionally whatever I was dreaming about cooking tastes so good in the dream I have to make it for real. This was one of those times. 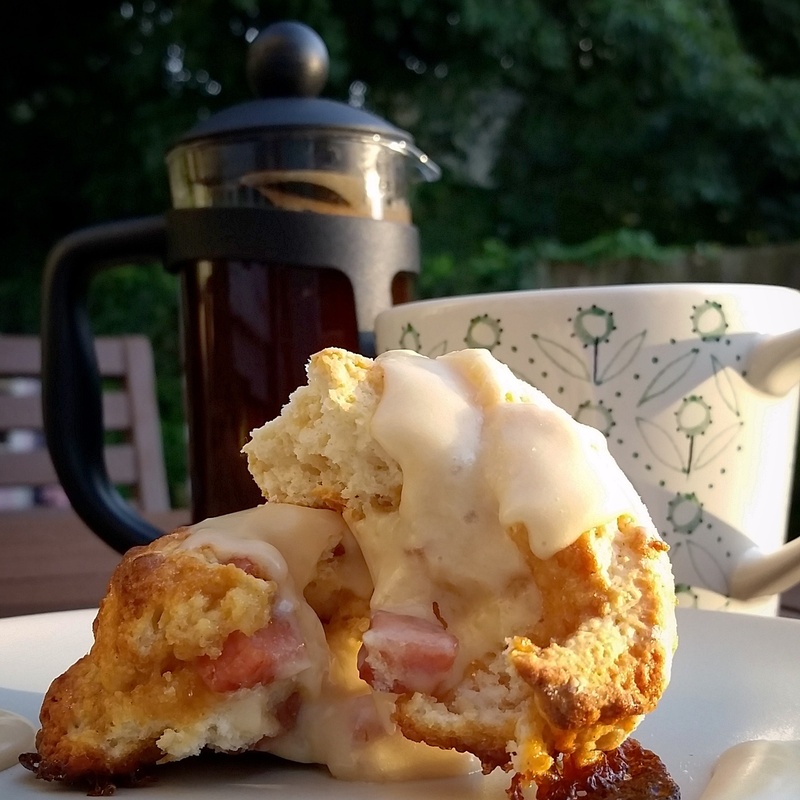 I awoke from my slumber thinking I had come up with the most amazing amalgamation of two world renowned breakfast staples, so was slightly disappointed when I looked online and realised that actually my American brothers and sisters cottoned on to this phenomenon a long time ago! 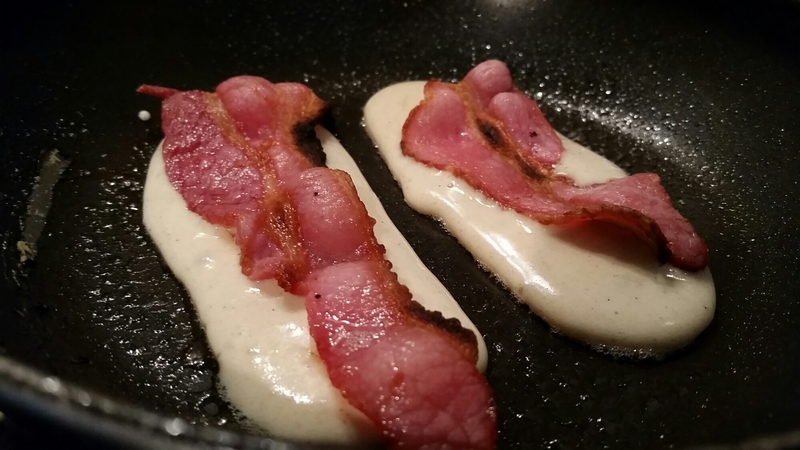 Crispy smoked bacon encased in fluffy American style pancake batter, sprinkled with icing sugar and dunked in maple syrup. OMGOSH, heaven on a plate. I was trying to wait until our upcoming camping trip before making these, but caved when I decided to make the batter ahead of time and freeze it ready to take with us on our jollies. 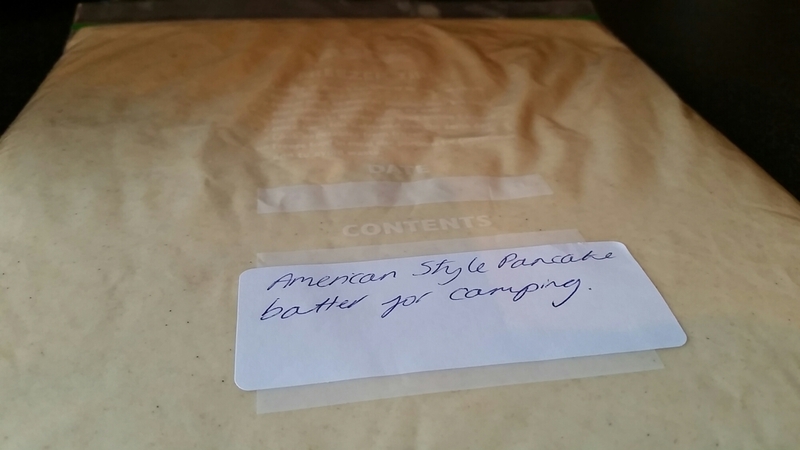 Firstly, whip up a batch of your favourite American pancake batter. My go to recipe is here. 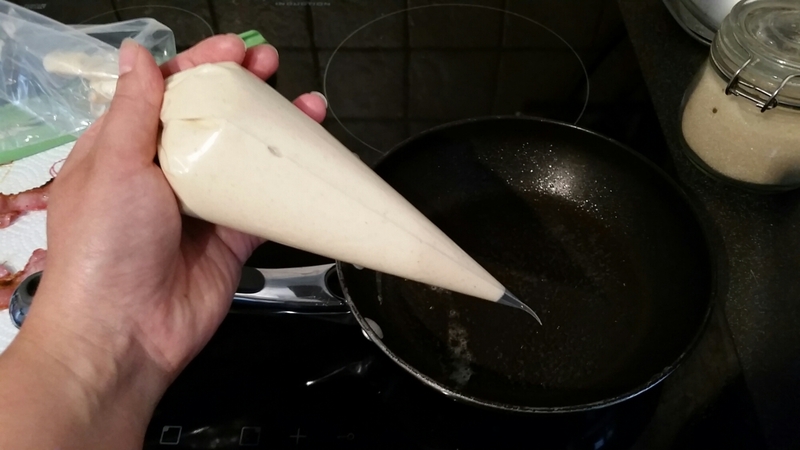 If you’re using it right away pop it in a piping bag, or a condiment bottle as it makes it easy to shape when cooking it. 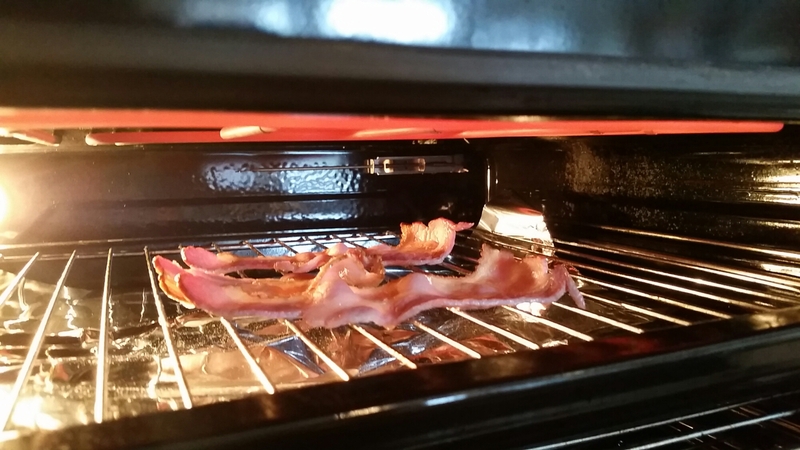 Grill some smoked streaky bacon until crisp. Then set it aside on some kitchen roll to absorb the excess fat. 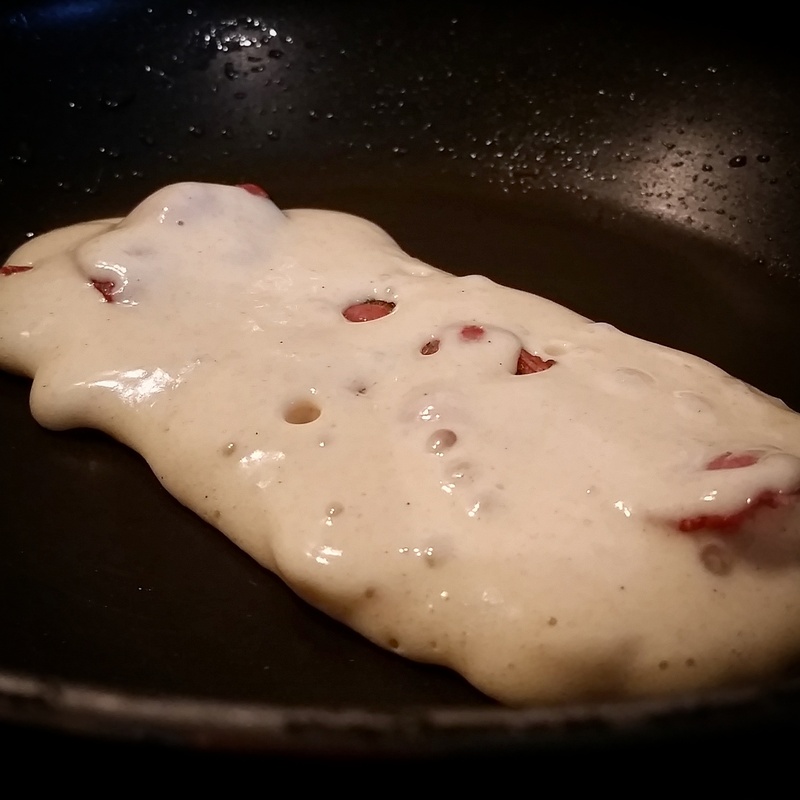 Pipe long oval shapes in a greased frying pan, top with a piece of bacon and then cover the bacon in another thin layer of batter. Cook over a low/medium heat until bubbles appear in the batter then flip over and cook the other side. 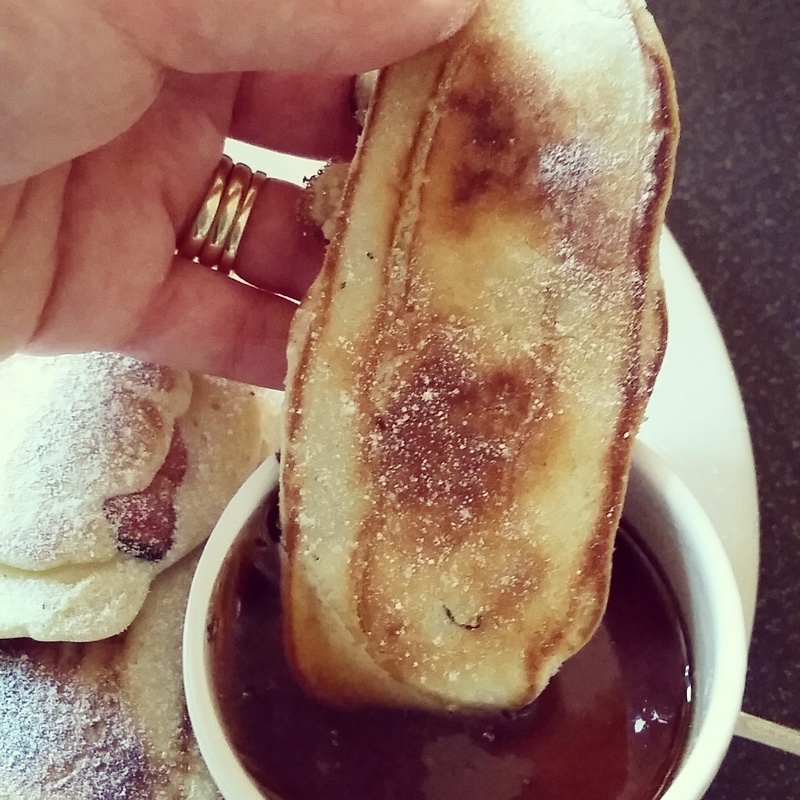 To serve sprinkle with icing sugar, and dip in warmed maple syrup. I tripled the recipe on the link, poured the rest into a zip lock bag and will freeze it to take with us. If you lie it flat in the freezer it makes it easier to transport as it will stand up in the cooler and there will be lots of space for other meals too. Also, the bag will double as a piping bag when you come to cooking it. 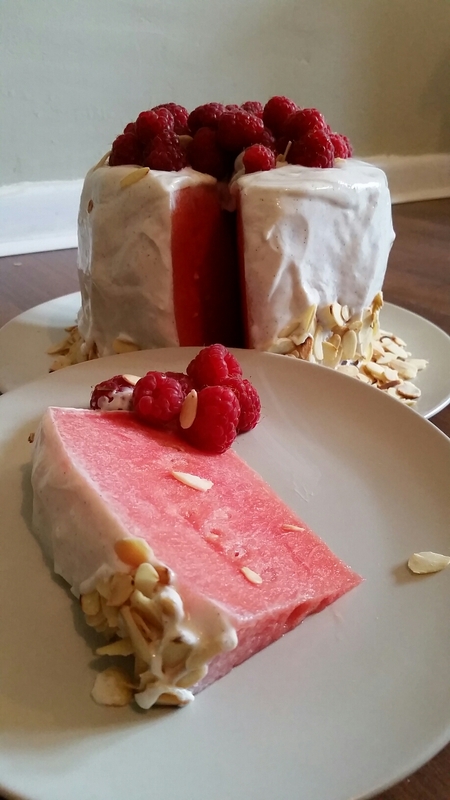 On my eternal quest to provide healthy but interesting cake alternatives at the social action and outreach events our church puts on, I had a go at a watermelon “cake” I’d seen on Pinterest, adapting the recipe to use a healthier buttercream alternative. 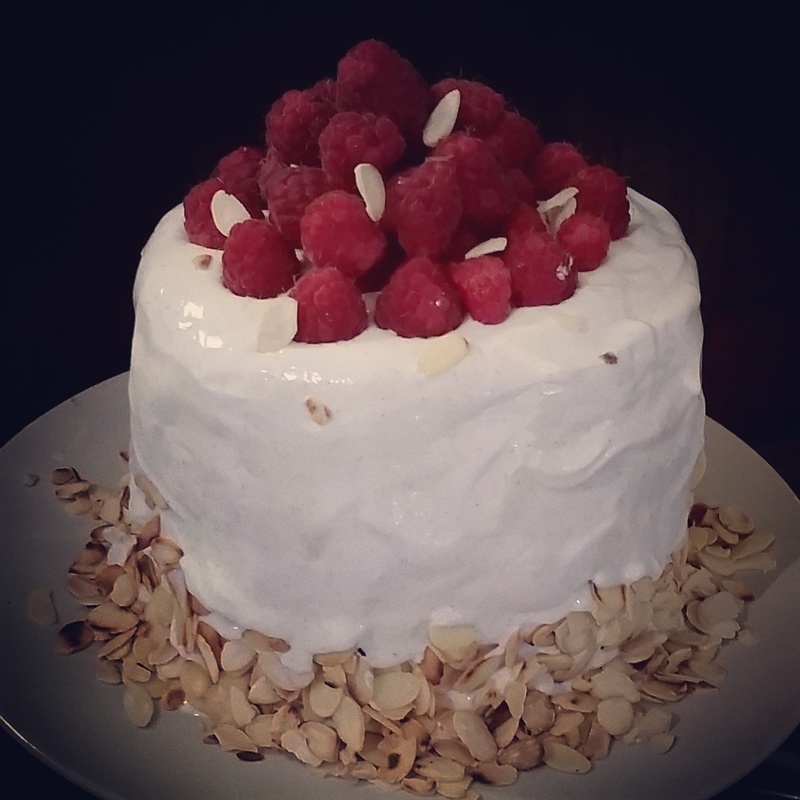 I say “cake” as it is actually just fruit, yoghurt, vanilla bean paste, cream cheese and toasted flaked almonds. 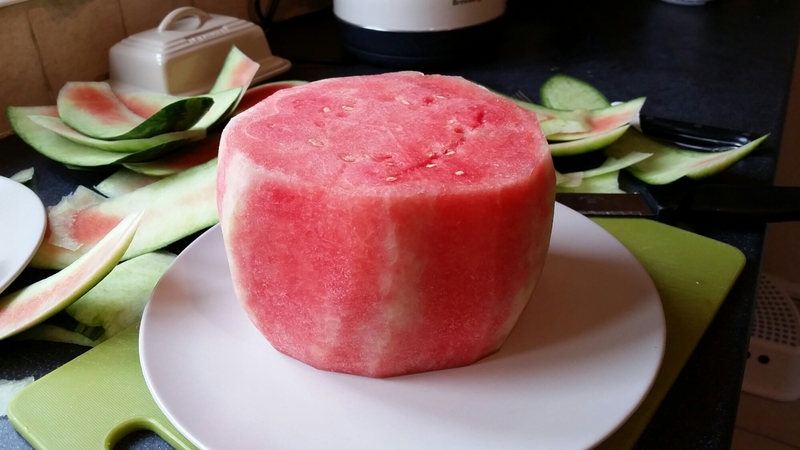 Cut a watermelon into a rough cake shape. Beat 100g light cream cheese then add 250g fat free Greek yoghurt and a tablespoon of vanilla bean paste. Taste the frosting and if it’s not sweet enough for you add in one or two tablespoons of icing sugar. I don’t think it’s necessary really as the vanilla sweetens it beautifully. 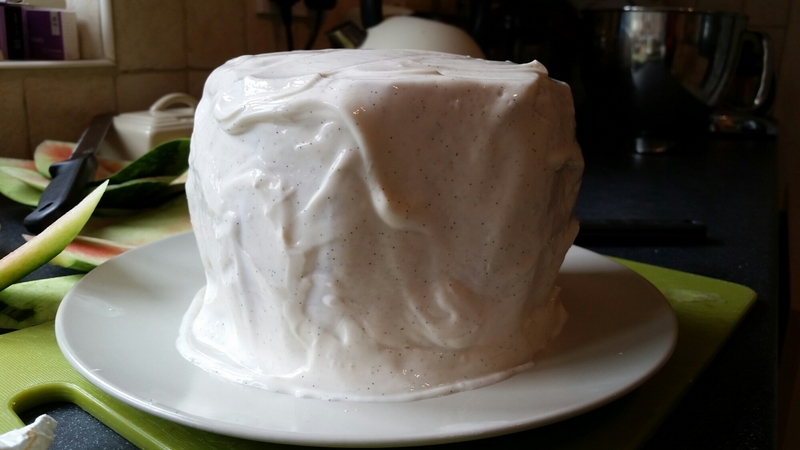 Cover the melon with the frosting. Lightly toast a couple of handfuls of flaked almonds in a dry pan, allow to cool then sprinkle on around the base. Decorate with whatever fruit you fancy and leave in the fridge for the frosting to set a little. 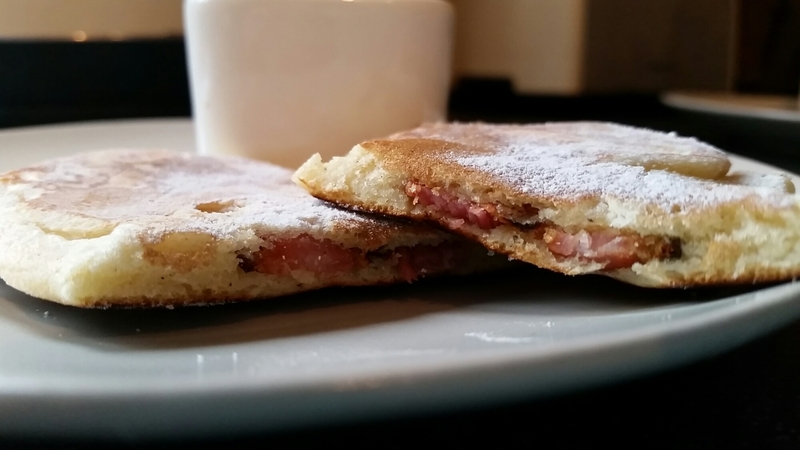 Slice and enjoy… Guilt free!